Last October my husband and I drove to Springfield and prescreened the new movie The Mighty Macs. It releases on DVD today (February 21). The movie is based on the incredible true story of the 1971-72 Immaculata College team that started in obscurity but became the original Cinderella story in women’s basketball. This team of pioneers went from barely making that inaugural tournament to the first dynasty in their game. And Coach Cathy Rush, a head of her time, became immortalized when she was inducted into the Naismith Memorial Basketball Hall of Fame. We watched the movie again last night. At the surface The Mighty Macs is a light hearted, feel good, root for the underdog team, type of story. It’s rated G and is considered family friendly. Bad language or immodest clothing is not an issue with this film and there are plenty of scenes that make you smile. But, if you dig a little deeper there is more to the story. Cathy Rush is recently married and she takes the job at Immaculata College against her husband’s wishes. It is a source of contention in their marriage throughout most of the movie that is until her husband gives over to her plans and goals in life. I realize that this was during the era of feminism, but downplaying the wife’s role while exalting the feminist agenda sat funny with me. Say what you will, but the portrayal of Cathy Rush was an “anything you can do, I can do better” attitude toward her husband. And this is certainly not the type of role model I want for my daughter. Then you have the scene with Sister Sunday, the assistant coach/Catholic nun, at the bar drinking and being hit on. If that is not enough, the elderly nuns at the college give money won from gambling to help support the team’s travels. But if you can overlook all of this then perhaps this is a family friendly film worth watching. If you like, you can find out for yourself. I am giving away a copy of this DVD. So leave a comment and let me know what you think about this review and I’ll send The Mighty Macs DVD to one of you. 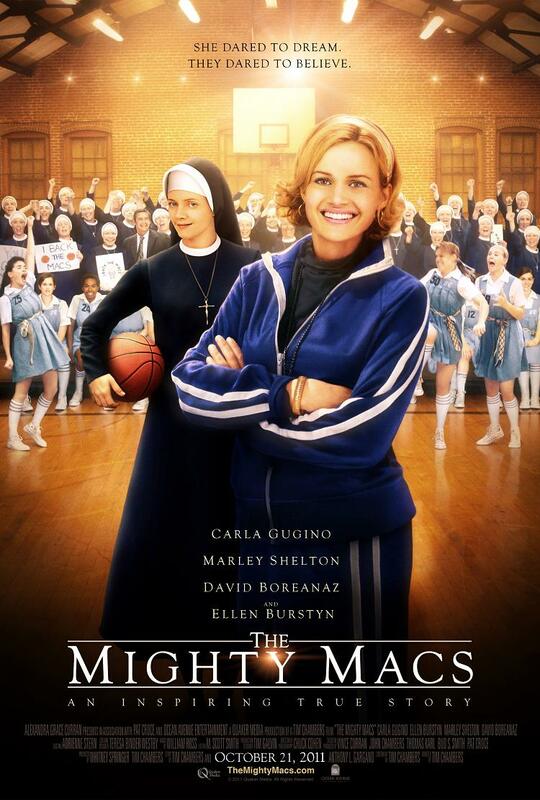 Disclaimer: I received “The Mighty Macs” DVD in exchange for an honest review. I do not receive any other form of compensation for the reviews posted on this blog. I saw this previewed and have been wanting to see it. I figured it would be a good Christian movie bc I think I saw it previewed on the Courageous DVD. After reading your post, I’m sure you are right about her feminist attitude. A lot of movies like these have women with similar attitudes. Hey Kimberly! Looking forward to the end of May as to what the Lord has laid on your heart for our ears and hearts to hear. Oh yeah, and the beach too. = ) The movie does sound interesting to me. I am/was a basketball player so I would love to take a look at it and see what its all about. Thanks for the review! I don’t know if I am in time for your give-away or not, but either way your review was very helpful. It is hard to find good, clean, family-friendly movies that share godly values that we want to pass on to our children, and I appreciate your honest comments about both the positive and the negative aspects of the movie. Blessings to your family!